We would like to thank QNAP for supplying the review sample. QNAP has lately released many new models with Intel's fresh Bay Trail SoC for good performance and very low energy demands. An ideal CPU for a NAS since QNAP's embedded Linux operating system doesn't require strong components to be snappy, we evaluated the TS-451 with the same CPU in our last review. The TS-451 mostly addressed enthusiast users and SOHO (Small Office Home Office) environments. Today, we will take a look at the HS-251, a unit for use at home which, thanks to its slick design and passive operation, will be the ideal choice for those who need a strong NAS and HTPC combination. Another strong feature of this specific NAS, aside from its highly efficient, but adequately strong CPU, is the bundled HDMI port (it actually has two but one of them is reserved for future use) through which it can be connected to a TV. It also comes with the XBMC player you can use to reproduce multimedia content. There are only a few passive NAS servers, and QNAP, wisely enough, thought to release one with a rich feature set. 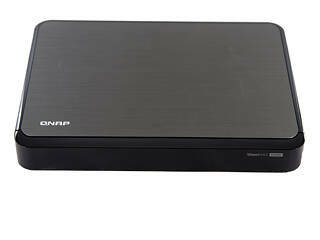 Its design has nothing in common with other QNAP NAS boxes, and one could easily mistake it for a Blu-ray player. The HS-251's polished finish also looks really cool, and we are pretty sure it will be appeal to most of you. Its only downside probably is its very high price for a two-bay NAS, but as you will see, the HS-251 has much more to offer than a common NAS.